There can be no doubt Obama's primary focus will be on jobs, the economy and the deficit because that's where the votes are. But, I'd bet money, marbles or chalk the Tucson tragedy will be touched upon as a need for greater civility throughout the land - including Washington. More civility from the people responsible for running this country? APPLAUSE, APPLAUSE! I just think we're living in pretty sad times when it takes a horrific shooting like the one in Tucson to accomplish it. Not very much. The old rivalry is still there between the parties and no matter where they sit it will not change anything. It will take a lot more than sitting with your "date" to convince me that partisan politics is a thing of the past. The examples you have mentioned of changes at MSNBC and Fox are due to us, not them. I believe the tragedy will make our politicians' behavior less juvenile. Bipartisanship will be shown as will genuine civility. How I hope this can last. Although the President Obama's State of the Union address will focus on the jobs and the economy, the address should also focus on civility in our public discourse and domestic security (gun control). President Obama should implore the nation to return to common sense and common decency. I don't know as I'll be watching a Netflix movie. Jack: I believe the Tucson shooting might affect the State of Union address by mentioning those who lost their lives through this senseless act of violence. President Obama might talk about some of the things Representative Gabby Giffords championed for those in her congressional disricit. The main part of the speech will cover jobs and the economy. President Obama will speak of working together to solve these problems. He will move toward the middle of the road to solve unemployment by offering small, medium, and large business more tax incentatives to hire new employees. He might suggest reducing the inheritance tax, so family farms and businesses can remain in those families. Anchor persons stopped being news readers when they discovered that sensationalism attracts money and viewers who prefer reality TV over reality. The question should be: Why on Earth should the demented actions of a mentally challenged idiot have any effect on the State Of The Union Address? They are being politicized, for propaganda purposes. Something I have found distasteful in many State of the Union addresses, by a number of Presidents. The president always has bent over backwards to gain cooperation from the Republicans to deal with America's priorities. That's despite people like Mitch McConnell openly saying at the start, that the Republican priority must be to deny a second term to the president. No change from the president, hopefully some bipartisanship from a sobered Republican Party. When is congress person Giffords going to resign....jeez! Jack I'm tired of the Tucson shooting coverage period! Good Americans are getting murdered everyday and some never get any coverage at all. And if they do it's only a short mention of it on the news or in the paper. But when a prominent person gets shot or killed it's on for weeks and weeks! Are their lives more valuable than anyone else's? The State of the Union address should be about this economy and jobs that's it! Although the President Obama's SOTU address will focus on the jobs and the economy, the address should also focus on civility in our public discourse and domestic security–gun control. President Obama should implore the nation to return to common sense and common decency in our public discourse. There can be no doubt Obama's primary focus will be on jobs, the economy and the deficit because that's where the votes are. But, I'd bet money, marbles or chalk the Tucson tragedy will be touc hed upon as a need for greater civility thoughout the land - including Washington. Last year the guy spoke for a little over 1 hour so if you chose to watch, - keep an eye on the clock. Anything over 30 minutes and I'm going to bed. I hope the Joint House and Senate session will be civil and not yelling out like school kids. Talk about a competence test when needed. Lets get back to the business of getting this country on the road to recovery and not grandstanding (BOTH SIDES). I hope the Tucson shooting effect not only the State of the Union Speech, but more importantly the Tea Party and Republican rebuttal. Tuscon shooting will quite the tone of the speech and the use of certain words. we can solve our problems with out killing some one. The Tucson shootings should not affect the State of the Union address, unless the President wants to talk about the mentally ill in this country and why this maniac was allowed to be walking the streets and purchasing a firearm. If he tries to connect it to comments, graphics and debates in this FREE country, then I believe he will be campaigning instead of talking about the state of the union. It will affect it – I'm afraid it won't do much good though. I'm afraid neither side will actually do what's best for the country in banning extended magazine clips for sttrengthening the gun laws without taking guns away from those that just feel they need them or actually try to better address the need to improve mental health treatment – the members of Congress will more than likely pony up to their lobbyists who will remind them over and over again how they were elected to Congress. Well, supposedly the Reps and Dems will "cross the aisle" and sit together and make nice. What a farce that will be. That's about all I can see that will be changed by the shootings. Otherwise, it is business as usual. The Tuscan shooting will be just another occasion for the government and education system to deflect the real reasons why; and instead of putting cameras and surveillance to watch what our Public officials and employs are failing to do; it will be another excuse to destroy the Constitution! There will be 30 seconds of recognition for the hero and then back to business as usual. Promises and fuzzy math along with more promises and then afterwards several lies from the response which will be based on more fear. The tuscon shootings should not affect obamas state of the union. 43 people are murdered every day in america, and nobody seems to care including the media. Why are the 43 people who are killed everyday not mentioned. Where is the moment of silence, where is the outrage, where are the prayers, for the 16,000 people killed every year. I would like to hear what obama is going to do to keep america safe, instead of spending 200 billion a year to keep iraq and afghanistan safe. Other then Obama playing musical chairs with members of the congress to try and appear united that is about it. Our congress could not be any more divided if you put a fence between them. Gaby's shooting is old news Jack. People want to hear about jobs and the future of this country and Obama needs to stick with those issues. I don't think it will be brought up unless to wish Representative Gifford a speedy recovery. This was the act of a deranged young man and has no place in a State of the Union address. Only a very warped mind would attempt to use this for political gain. I think in light of the shootings in Tuscon that it would be wholy appropriate to begin the speech with all standing in a moment of silence for the fallen there and our troops in the middle east who have given their full measure of devotion.The rest is window dressing! The President's address to our country will be exactly what we need to hear. Encouragement, hope and unity. Starting the with hate, anger, division of our country constantly touted by Palin, respect, responsibility, accountability flew out the window. Anything and everything was attemped by politicians, throwing away all respectibility and ethics which brought our country to great unrest. Hopefully the Tucson tragedy and President Obama will help change some of that. Jack,didn't Rahm Emmanuel say to never waste a crisis,well the far left loons are taking him to heart by trying to shut down opinion,Yes,it will affect the state of union,it already has,as for affecting the President State of the Union speech,no,it will be the same evasive wishy washy rhetoric as we have been bored by in the past! Frankly, most people are getting tired of hearing about Tuscon and the Giffords shooting. It's the same news over and over. Let's go on to something new. For starters, the young intern that came to the assistant of Gabby will be acknowledged. And just like the November 2010 midterm elections, "all" politicians have heard the American people have had their fill of the continuous bickering and pettiness coming from both parties. Both parties have come to realize that their words have impact, either negative or positive, on the mood of the country and subsequently could have unintended effects on listeners that face mental challenges or that are easily influenced by others. I am hopeful that the robust discussions around civility will return our politicians to becoming more statesmen as opposed to perennial campaign junkies. Gabby should get a Congressional Gold Medal if there is in fact ANY return to Civility and Common Sense. On second thought, she should get one regardless, just for being a class act. The Tucson shootings might causes us to see something we haven't seen in a long time on the floor of Congress. People starting to realize especially Congress that we need to tone things down. We are all Americans and want nothing but good for our country. We just have different ideas of how to achieve it. Kindness and respect towards one another will go a long way in achieving our goals. I think it is blatant Obama theatrics that will tone down the SOTU. Obama and others are exploiting the actions of a crazy person to seem like he is a great compromiser or centrist before the election. He is trying to rebrand himself, and people are getting fooled. A change in tone does not change one's politics. Politics has never been civil. It's a clash of ideas and Obama's actions (not words) are so far out of step with American values and principles that the Dems were wiped out in November. The President has never been about compromise, and he won't be any time soon. He thinks the November election was a result of his failure to communicate effectively. People need to be grown-ups. This "tone" conversation is just a joke. It should be a wake up call to all decent Americans, that our constitutional laws needs an update. The second amendment has to do with a citizen army of three hundred years ago. It has nothing to do with "modern" citizens of today carrying guns around town, or to a presidential/ congressional town meeting(s). I thought what David Stockman (Reagan's Budget Director) had to say on Bill Maher's show last Friday night, hit the nail on the head. He commented that thirty years ago, our national debt was at one trillion dollars. And in thirty years of Republican rule, we've seen that dept rise thirteen times to 13 trillion dollars, and our economy only grew 2.5 to 3 times. In other words, our economy (Americans working) is not catching up, to offset the dept. But the good news is, Walmart has three thousand stores! So the communist Chinese aren't going to bomb us any time soon.....at least with explosives! A Politician will always use a tragedy to benefit out of it politically. So I have no doubt that Obama will use the Tucson tragedy in his speech, and I am purely guessing that he will use it either over gun control, or owning a gun for self protection. But be sure he will use it. What I would like from politicians, in addition to being kinder, is honesty. I hope President Obama, in his State of the Union address tomorrow night, does not sugarcoat the trillion dollar mess the U.S. is in. There's nothing I hate more than when someone insults my intelligence. Well Jack, at least Joe Wilson will be surrounded by Democrats. I think it's called "forced civility". Sorry, Tucson is now just old news. The Rep. Giffords recovery and rehabilitation story is fading. We do not care about Americans needlessly dying: 43/day hand guns, 42,000/yr traffic accidents, 17,000/yr lack of access to health care; do not cause any concerns. Stand by for the Super-Bowl. The Reich-wing-nut talkers will tell us we must cut health care, education, while still wasting a TRILLION dollars, and counting, on two wars. The State of the Union address is just a show to give the media something to talk about between commercials. Senator McConnell Republican leader in the Senate has already said he has no plans to listen, cooperate and work for reasonable ways to solve our problems. How will the Tucson shootings affect the State of the Union address? We will see those Lawmakers willing to work with both sides of the aisle actually sitting on the opposite side of the aisle. And we will not have disrespectful Joe "You Lie" Wilson moments. The State of the Union is still just a speech. This civility may last a week, but it's effect will be like putting hot fudge on a Sunday. You'll see some thawing around the edges but it's still frozen under the surface. The chill of the No party will still be there thanks to the freeze that the Tea Party and the ultra right has put on compromise. There will probably be more civility than in recent years. Unfortunately, ethics, greed, morality and respect have been on a steady decline for several decades in this country, halted only momentarily by horrendous events, such as Tucson and 911. I believe your skepticism is well founded when you expect things to get back to treachery as usual soon after this blows over. There are too many greedy, ruthless companies buying unethical and immoral lawmakers who have no respect for their constituencies for any real return to life as we knew it 50 years ago. President Obama will double down on the calls for civility and bipartisanship that got him elected. As much as I'd love to see the Republicans do the same, I'm just not sure they're capable of it anymore...it's a lot easier to scare people and make them mad than to actually lead. Shouldn't effect it at all. I think jobs will be the theme of the state of the union address. The Congress and the President need to "get er done". It's hard to see how rude, partisan remarks would help the President or the Republican giving the response. People really are tired of hate and sarcasm as a mainstream political tactic. With the President's approval ratings climbing, maybe the Republicans really will get on board and start working for the good of the American people. The Tuscan shooting will be just another occasion for the government, and public education system to deflect the real reasons why; instead of us putting cameras and surveillance to watch what our Public officials and public employs are failing to do; it will be another excuse for them to destroy the Constitution while trying to make up for government incompetency! I hope not at all... Time to move on!! It will take a lot more than sitting with your "date" to convince me that partisan politics are a thing of the past. The examples you have mentioned of changes at MSNBC and Fox are due to us, not them. I believe the tragedy will show a change in their behavior to less juvenile than has been shown previously. As far as a permanent change, I remain hopeful but doubtful. Not very much. The old rivalry is still there between the parties and no matter where they sit it will not change anyhthing. "How will the Tucson shootings affect the State of the Union address?" I think the tragedy in Tucson will have a definite impact on the State of the Union Address (itself). I'm not so sure about its listeners and viewers however, as the tea party and its followers have ginned up so much hate and vitriol that it's going to be difficult to settle them down and persuade them to act like grown ups. the "tea partiers" who engaged in this type of politics in the course of campaigning for the new offices they now hold. I expect to hear a call for dialogue, exchange, solidarity and the creation of positive relationships. Our Union can only stand, and get on with the business of government, as long as we are civil and united states. The shootings will unite us, there is no doubt of this. We will be told this, we will have our perceptions molded such that we will trust in those involved in national leadership/ financial fraud to tell us how we should feel....in case it might effect a favorable vote for the party in the whitehouse. Remember we have already begun the campaigning for the next election. The State of the Union is a photo and verbal op that cannot be wasted. But this is about the nation and we got troubles right here in "River City", Jack. Jack it will have an effect that will last until the cameras are turned off. Then then we can all go back to acting like spoiled children. . It all depends on what they are told to do by the t-party. You have to mind the boss, right? I would rather see congress and the court judges stay home rather then cause a scene. If only the knew how stupid it looks. I think your next question proves that they do need competency tests, judges included. Sorry Jack, I don't see the Tucson tragedy as having any type of effect on the vitriolic rhetoric that permeates today's political atmosphere. A month from now it will be back to status quo in this regard. There are too many elected Senators and Representatives that seem to forget civility is the first step to compromise on any issue. It is disgusting to see supposedly intelligent people make rash judgments and vote the party line whether the bill benefits citizens or not. My Dad told me as a teenager that there is a big difference between a statesman and a politician. Amen, Dad! Obama will pontificate on how enormous of an event it was and how everyone within a hundred mile radius deserves a Medal of Honor. There's no end to the hype.............i.e. Katrina. I think it is a great idea that these guys come together and sit amongst each other, even if it is only symbolic. This country has plenty of nostalgic symbols, I can do with one more. There is nothing but lunacy on the fringes of the right and the left. Ninety percent of the country knows how to have a debate for debates sake, but lets face it there are a few million people out there that would rather push against the center then get things done. We are in a crisis, and we need serious minded, not idealogs, to get things done. Whether you like Obama or despise him, whether you like Bush or despised him, I am of the opinion that they are both serious people trying to deal with serious problems. Why does it take a national tragedy for us to realize how much more we all have in common. Let's get this country moving again and stop pushing against the middle! Hopefully the President, this year, will not engage in the unprecedented action he took last year of publicly criticizing the Supreme Court while they were seated in the Chamber. This disrespectful act was something no other President had done. We can only hope the President will take his own comment to heart and tone down his disrespectful tone and comments. All of this emotional,sensationalized rhetoric has helped create an environment for more Tucsons to happen. Maybe now from seeing the adverse affectes of this posturing and Them ALL being potential targets will wise them up and have them realize they are ALL in this together. All Americans are in this together. Get busy and start creating a better country for our citizens to live in now and for the future instead of backbiting and infighting. Surely you jest! No effect what so ever. The GOP/Tea Baggers think they are doing what the voters want, but they aren't and will be against anything Obama says or does. Even as Obama's poll numbers climb. I Believe That This Year's "2011 State Of The Union" Will Be A Somber And Straight To The Point Message, It'll Be A Somber One This Year Because Gabrielle Giffords Is Not Going To Be There And Its Going To Be Straight To The Point Because President Obama Is Going To Tell Us What He Expects Out Of The New Republicans In Town Weather The GOP Listens And Works With Democrats Will Remain To Be Seen! I Think All In All This State Of The Union Will One To Remember! No effect at all. You can't undo decades of hatred and corruption that easy. Let's hope that the victims, which included a small child, will not have died in vain. The people who attended the Tucson meeting went to share their concerns for a better America. Next to the need for jobs in the United States, is the need to reform the way elections are run. When I hear of the cost that is spent to win makes me sick. The one that has the most money wins. That says to me, "We the people" will never win. How can we fight the elite. We need term limits, no retirement or health benefits and less pay for the elected. Tragedies have a way of bringing all people together for a brief moment in time; Oklahoma, 9-11, New Orleans and the gulf coast, Tucson. Possibly this time the change will last for more than a moment, I do not know, that would call for each and every American to go inside themselves and correct themselves, to stop trying to take the speck out of our neighbors eye when we have a log in our own eye. But, what I do know is that to go on building a society based on absolute ideology and spewing hate for anyone who does not think the same is doomed to die in the end and suffer every step of the way. How will the State of the Union address (and the Congressional response) affect future assassination attempts? Any affect will be superficial. Congress can sit together and sing Kumbaya but the divisions are too deep to heal. I, for one, will NEVER forgive being called "unamerican, "extremist", racist, and "astro turf"
Weak question Jack, must be a slow news day. What stretch of your imagination connects a shooting to a state of the union address? We've lost thousands of soldiers year after year and not once have their loss affected a speech, unless I'm not listening. Get real my man, you're a better journalist than this. Washington shudders in the shadow of the National Rifle Association. Any serious concern with new gun laws are just a pipe dream. Even as more police and government officials are being targeted every day, the NRA clings to their guns and see any laws as a slippery slope to a total gun ban which would send this country spiraling into another civil war. This is one Pandora's box no one wants to open. The Second Amendment and its loose interpretation guarantees we have no recourse. I agree Jack, it would be nice. However, you see things like our Representative, Michele Bachmann still running around whipping up the partisan rhetoric and I think this is just window dressing for the time being. Unless Boehner, Reid, Pelosi and McConnell lay down the law on anyone that gets out of line, I'm afraid that the vitriol will come right back. Old habits die hard and bad habits are very tough to kill. I would love, just once. to see a State of ther Uniton Speech in which Congress simply sat and listened and we would not have to endure the Jack in the box jumping up of either the Republicans or Democrats. It would give more cohension to the speech and less theatrics. Jack, I was pleased with Sen. Udall's movement to get members of Congress to show unity at the SOTU. Symbolism can have an impact. We the people are tired of the blistering injustice demonstrated by Congress – spending more time tearing down each other than building up our country. And perhaps the President's speech at Tucson will gain momentum with those who were sent to Washington by the people will set the example for the people! Jack. I'm not sure how the Tucson tragedy will affect the S of the U address, but I sure know that it has had an effect on a lot of Americans patience for this vitriol. State of the union speech? More like a reelection speech. It won't affect it at all. Americans have never cared how many people are murdered, where they live or anything else about them. Men, women, preachers and yes children get murdered every day and nothing ever changes. Countries all over the world have people with the right to bear arms and don't come within 10% of the murder rate reported in the US. That means the problem is psycological and to think the the recent tragedy is going change that is just stupid. I hope it is the beginning of the end to retoric we have all grown to dispise. It's a shame that the people we send to congress decide for us what we hate, like and want to change etc. It's even a bigger shame that fear of being attacked in a public setting will be the biggest influence on what is said going forward. Troubling as it is, they seem to have brought it on themselves. Let's see if the sitting together will determine if "United we stand" or United we Sit. Perhaps the Democrats and Republicans may come to the conclusion that they represent the public. What a change that would be. Perhaps it could be refreshing, but I will not hold my breath. No matter how civil lawmakers are while attending the State of the Union, it will not create jobs, fix our economy or reduce the deficit. We need a civil, intelligent conversation in the halls of Congress so that together we can fix the U.S. There will be a brief mention of the Congresswoman, an enthusiastic round of applause and so much for that. What was it Andy Warhol said about fifteen minutes of fame? the liberals will be lapping up anything the "president" has to say. according to them its everyones fault that there was a shooting but their own. 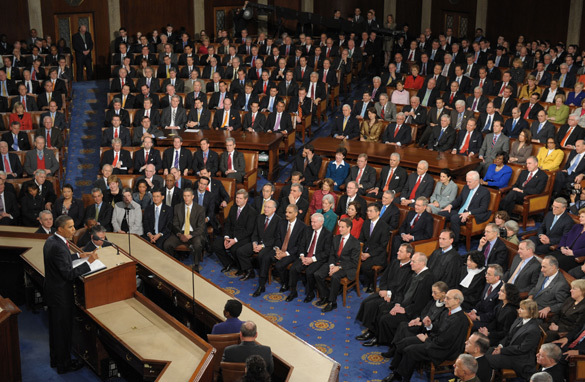 The state of the Union Address should begin with what have we done in the basic needs areas of the citizens. What is the current status of America on feeding, clothing, housing, health, education, communications, transportation and energy and wages. What is the degree of satisfaction for these needs by the American Citizens? What are we going to do about it? Programs to fix. Goals for the next five years. If more members of Congress could take note of Congresswoman Giffords' class act, they might be inspired to remember why they are there in the first place: to serve us. She certainly seems to be clear on her role but most of the other Congress members seem to have it backwards. Pres. Obama has reflected back to us the importance of civility in our debates and so many regular people, like myself, happen to agree that all views are worth pondering as long as they are delivered without hate, contempt and fundamental disrespect. I doubt that the incident will have much affect on the address, but may affect the response. Right now the spotlight is on the the attitudes and language from both sides of the aisle. We'll see. The Tucson shootings are not a cause or an effect, but a symptom. And I think many Americans are starting to turn away from the vitriol of people like Beck and Palin. I hope the President will expand on the themes he sounded in Tucson, because Americans need to hear it. And less public and political vitriol may even affect our health care debate: everyone knows that excessive anger around can make you sick. I would bet that you won't hear any of the shout-outs, or comments related to the courts that were the highlights of last year...It will be interesting to see how the paid attack dogs are going to deal with a seemingly more conciliatory President with soaring ratings in the upcoming cycle..Oh yeah, those yapping dogs that promised 100 billion in cuts should be asked very very pointedly what cuts they would offer in their OWN districts..If they have no plan for that, what use are they...? The Republicans are already fighting over who is going to give the rebuttal speech before the President has given his address. That's a good indication the Tucson shooting will have no affect. Hopefully, They will be less partisan, Jack. However, knowing the politicians, the bi-partisanship will end after the SOTU,just like the rhetoric will eventually riseagain. At least them sitting together is a step in the right direction. Actually the Tuscon shooting had nothing to do rhetoric nor the verbal attacks the politicians directed at one another. The people need to tell it as it is no matter who's feelings get hurt. Besides,this Jerrod Laughner acted totally on his own. Civility? Unity? What do those words mean anymore, Jack? With extremists on both ends acting like lunatics, Representatives and Senators acting like spoiled children, and a Supreme Court acting as if they are above the laws of the land, I unfortunately don't see any significant changes to be caused by the shooting in Tucsan. What would really be nice is a live link for Representative Giffords so that she could actually "participate" in the event (if she is up to it). why would you even think such an event as the Tucson shootings will change the way things are done in Washington? None of the past political shootings changed the way Washington does business? in a word, NO! Tucson will only get a mention, and then they'll go back to regular D.C politics. Oh yes, lets not forget the sideshow, lets all sit together theme, that will make for great press later. Why should it be any less partisan than what President Bush had to endure from Democrats? I am curious where this media concern about bi-partisanship and civility was during the 8 years of George Bush? It seems the concern only became an obsession of the media once a liberal Democrat took over the White House 2 years ago. Incivility did not begin then....it has been going on for a long time. We saw the most nasty rhetoric directed at President Bush, as well as the Democrats obstructing him while in the minority. This is a theatrical production clear and simple using politics to gain the upper hand. Washington is broken due to lack of term limits, special interests and partison/self serving interests. To think this will change si nothing but a fairy tale. Hopefully we will see some civil human beings. We are all entitled to our opinions but we need to respect one another. All these clowns republicans and democrats alike need to remember they are there to serve the people of the United States. They have not been doing that. It is time to get our country out of the very mess they have put it in, republicans and democrats alike. I would love it if he used the opportunity to call the media out on flaming the fires of all this hate language on TV. Everyone knows that's what is happening but no one wants to be a finger pointer since they probably have done it too. Words can make people do things. They influence how we vote, what we buy, what we do. Why wouldn't they influence a guy to get angry enough to take action? I don't like this question because your narrative already answers it. I don't mind you thinking that I need help in responding but you when you throw the response in my face I am offended. It's amusing to hear Mr. Obama call for civility after listening to his partisan namecalling, blame game playing, and incivil rhetoric, especially during the 2010 campaign cycle. If he was that nasty and not even on the ballot, imagine what he will be like next year when he actually is. The Tucson shootings may make a difference for one night only, after that none of the politicians will let this CRISIS GO TO WASTE. It will be back to the same old business as usual. Are things any better now than they were before Kennedy was shot. Have things gotten better since Reagan was shot. If anything they have gotten worse. Nothing will change. Things in the Media are already back to pre-Tucson days. The tragic events in Tucson will hopefully bring all members back to there proper seats and proper demeanor. They should all sit at attention and listening with a concerned ear to that which makes us all Americans and all so special. The thread that binds us is so fragile it’s been stretched too far. I am not much of an historian but what I do know is we are all remembered for how we cared and loved others not our differences at least that’s what I read carved on the stones in the cemetery. Waoo"' Jack, how can that be, when Glen Beck and others like him have taken their rants about guns to the next level. How can that be when there is this absolute and unfounded lies floating out there about Obama the commy, socialist and anti-American who has come to take away our guns. I suspect the President will take the opportunity to reiterate his point that using the tragic event in politically divisive ways is counterproductive. And we can only hope that members of Congress will show restraint and respect for the occasion by not casting aspersions like, "YOU LIE"! Both sides will seek to capitalize on it for whatever politcal gain they can. Business will continue as normal, our country being given away to the rich, while everyone blames the deficit on Obamacare. The "State of the Union" address will certainly be different. A show is a show and it must go on. There is only so much the " most powerful person in the world" can do. With billions of dollars fueling special interests it is hard to believe that any of the decisions made by the president or congress are their own. The very thought of congress being more friendly to one another is scary. It will merely be a "good faith gesture". The truth is, they will take their uptight politics behind closed doors. The worst is, both parties have the same agenda yet they cannot admit that to the public as that might actually tone down the "rhetoric" for real, thus ending the partisan show that keeps them in the prime time news. Exposure, exposure, exposure. Good, bad or indifferent "exposure" is still the best tool for the popularity of any candidate, and seems to be the most news worthy for shows like your own. Political figures might want to migrate to "Broadway" as the american people are becoming more and more aware that our politicians are good stage actors. No doubt the Tuscon "incident" will have an affect on the tone of the state of the union address. However, perception vs reality are not the same. The perception of the January, 2010 state of the union address conflicted with the November, 2010 election reality. Tomorrow night's 2011 "perception" state of the union address will not be fully defined until the 2012 election reality. If the shootings act as a catalyst for unifying Congress and awakens them to the needs of the people, the economy, violence and ending wars, then it will prove to have a positive influence . If not, then it will remain what it has been to this point. A mere political opportunity for the White House and Congress. It will be just another political dog and pony show. The president will nod to the anti-gun lobby and their errorous data. He'll fail to mention since 1991, 195,000 people have died yearly from medical malpractice, or that 37,000 people a year die from DWI/DUI or other comparable data. He'll select a high profile event and say that he, and only he, knows best. As usual. Neither side will come together and in a little bit the bombing of the Russian airport will blot out everything in our short attention spaned minds. As a result of the shootings in Tuscon Senators will sit with their political opposites during the State of the Union to demonstrate an ability to get along. As a First grade teacher these are some of the first things taught. : No name calling, respect your neighbor, and learn to work with your classmates whether you like them or not. It's "Elementary" Jack. These guys need to work it out or go back to first grade. The effect will be like a shot out of the blue. A real bulls-eye. It will bring about nation-wide uproars for weapons and ammunition bans for all mentally unstable individuals as well as those unmentally stable. The unfettered arms smuggling that clogs up illegal immigrant pathways into the US will almost certainly be completely blocked thereby allowing more fruitpickers and lawn service workers to enter the lack-of-work force here. That, in turn, will cause more disgusted former middle-class folks to search for a suicide-suitable weapon only to discover that the sky-rocketing prices for those instruments of self-determination are unattainable for them. Hopefully, the Tucson shootings will file the extremely sharp, hard edge off the political discord that is doing nothing positive for our nation. The State of the Union is what it is–good or bad. It is up to all of us to lighten-up to join together to make it better. Unfortunately this is a situation where The "United" States of America has often failed in the past. The Manturian Candidate's action will enable more rights taking legislation to be proposed by Obama. When our multinational corporations cease to profit from our division the partisanship will end. My heart goes out to the victims of the Tucson shooting. I find it, however, a little unnerving that about a dozen police officers have been killed in the line of duty this past week yet a blurb is posted on CNN.com. They were all public servants and should be recognized as much. We live in trying times so the President should talk about civility, love, and following the rule of law.